Monster Hunter Generations is a good game. However, it really doesn’t feel like one at times. After coming off of 50+ hours of Monster Hunter World, going back in time is difficult. The combat isn’t as fluid, it has technical issues and is ripe with loading screens every time you enter a zone. Hunting monsters and experimenting with all the weapons is still enjoyable, but it feels regressive after the leap Monster Hunter World made for the series. I mentioned technical issues and these are mainly in the village area. For whatever reason, Monster Hunter Generations has a real problem keeping NPCs on screen. Everyone must be a practicing magician because they are really good at vanishing into thin air only to appear once I take a couple steps forwards. This is super obvious when playing the Switch in handheld mode. It doesn’t ruin the experience, but it is incredibly jarring and there just isn’t an excuse for it in this day and age. Surprisingly, I didn’t really notice this issue when out on a hunt. It seems to be a specific issue with the village. The village is nice and everything, but I would prefer people not disappear once I walk ten feet away from them. Beyond that odd issue, Monster Hunter Generation plays exactly like one would expect from a Monster Hunter title. You accept quests solo or with up to three friends to gather items or hunt/capture monsters. You have six levels of quest to work through, starting at 1-star quests and progressing to six-star, with each level more difficult than the last. This Switch port also introduces G-rank monsters, more powerful version of monsters found in the game, something that was noticeably lacking from the 3DS version. It certainly wouldn’t be much of a Monster Hunter game without the monsters. You have a huge variety of creatures that vary from fire-fish Agnaktor to giant mammoth-like Gammoth and everything in between. Every monster has unique strengths and weakness and planning ahead is paramount. When fighting the Agnaktor, you’re going to want fire protection; and a lot of it. This planning makes every fight engaging as you test out different strategies to see what works best and the sense of satisfaction of taking down a particularly tough foe never ceases. Little intros serve as a great way to get a feel for the bigger monsters. Overall, these quests are still enjoyable. Monster Hunter Generation offers a variety of unique weapons that range from bows and bowguns to lances, hammers and many different types of swords. Each weapon type feels unique and powerful and it is fun to experiment and see what fits the situation best. The great sword is perfect for decimating bigger targets, but it can be pretty hard to hit smaller or faster ones. Along with the large variety of weapons comes armor and hunter arts. It’s important to diversify your armor as different elemental attacks can be devastating and lacking protection is just asking for death. Weapon arts are powerful abilities that attack, dodge, or buff with incredible results. They are a great way to deal massive damage or avoid a deadly attack. To activate a hunter art, you have to first build up the Arts Gauge by damaging monsters. While this gives you plenty of options in combat, the execution is clunky. Everything from dodging to swinging weapons feels slow and almost out of control. It doesn’t help that some nagging control issues, such as sprinting turning into blocking once your weapon is drawn, really slow things down. Notice a giant monster charging towards you? Don’t try to run away if you happen to have your weapon drawn because blocking a train is about as effective as it sounds. Another major part of Monster Hunter Generation are the pun-filled Palicoes. These cute Felynes act as buddies out in the field. They help you attack monsters, heal, and gather items. They are certainly helpful creatures, even if their puns make me want to tape their adorable muzzles shut. You can even play as these little guys as Prowler where you complete specific Prowler quests. Playing as Prowler is a great way to gather resources since you don’t have to worry about pickaxes or bugnets. The downside is you aren’t nearly as good at the combat part of hunting. Still, these quests are worth doing as they open new trading destinations at Palico Ranch opening up valuable resources, allow you to collect scrap to create new equipment for your Palicoes making them more effective companions. The Prowler mode is certainly a fun way to mix up the gameplay if you find things feeling a bit stale. 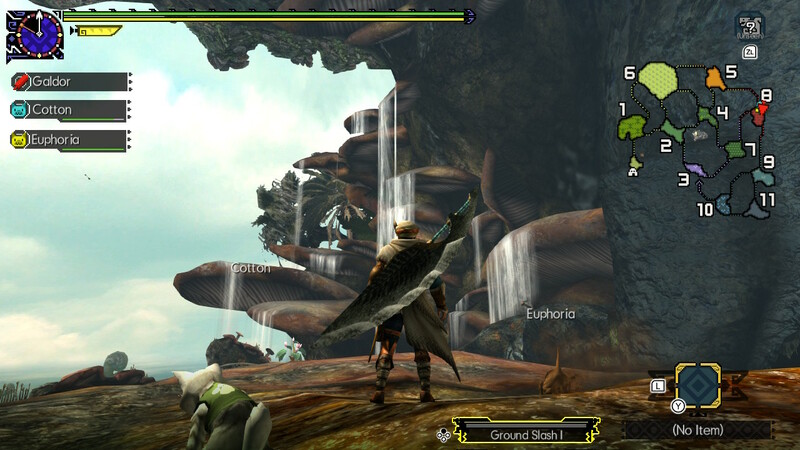 The Monster Hunter series has always had a great sense of scale, and this is still clearly present in Generations. There is certainly a lot to like about Monster Hunter Generations, but it does have annoyances as well. I have never been a fan of collecting pickaxes, bugnets, and bait to be able to collect the resources I need. They just waste up space and accidentally forgetting one means you are just better off restarting the quest. As mentioned previously, you are stuck loading every time you enter a new zone in an area, which is annoying enough on its own, but it is often difficult to tell where exactly the boundary between two areas lies and it is really easy to enter an area accidentally. I know I would love Monster Hunter Generations far more than I do if I never played Monster Hunter World. Generations is clunkier, slower, and lacks the size and polish of World. If you really want some Monster Hunter action on the Switch, then you can’t go wrong with Generations. New fans coming in hot of the heels of World, be prepared for a drastic quality difference.